Cloud computing represents a radical new set of principles and practices - paying for what you use, flexibility in contracts and commitments, and ease of use - that are changing the IT status quo. As the need for external IT resources increases, enterprises need to understand the shift in outsourcing models to ensure that they buy the right things, manage the services effectively and not get locked in to outdated models. 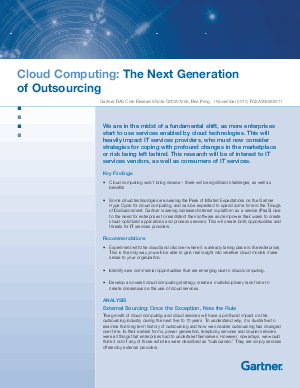 This paper analyzes the benefits and drawbacks of outsourcing cloud services, examines the business benefits and risks, and provides the steps you should take for a successful implementation.